Welcome April and lovely spring weather along the front range of Colorado. We are already to the fourth set of the Noah and Matilda Album block set. Another set filled with variety. This set contains the first of the grape blocks, but the only GREEN grapes. The maker of this block used solid green fabric. I chose green prints and solids. There are the only grapes I've ever stitched with a solid. I put the two together so you can see the contrast. There is another special wreath in this set. 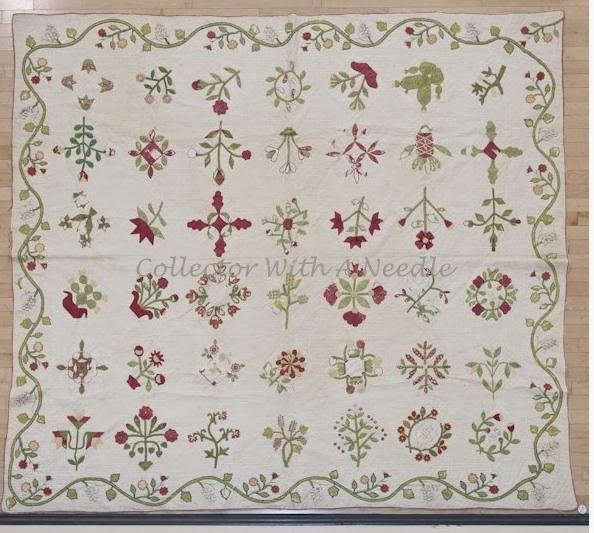 The maker of this block embellished around every applique piece with a satin stitch. Using the yellow and orange threads against the solid red gives an almost flame stitch appearance. Note the change to green along the base of the flower. This creates the look of a calyx without applique of a tiny green piece. I'm betting some of you do the red flower in two pieces/prints and skip the embroidery. It is always fun to see your interpretations. Of course the set needs a pot of flowers. This less than carefully arranged pot of flowers has some interesting shapes. The scale of the pot is small compared to the flowers. The green print used in this block was a green/black print. Also included in this set is a floral spray. The maker of this block used an over dyed green. Again, there are interesting flower shapes combining reds and yellows. See how far the stem extends under the yellow flower? To purchase any of the block sets click HERE. I'm still researching the family and dates and will write more about them in a future post. She's well stocked with toys. Her favorites are sparkle balls and a funny little pretend mouse. That is, when she isn't pretending it is alive and needs some wrestling. Amazing how she can make that little mouse seem alive. She is hard to photograph because she is always on the move. This is a little ensemble I pulled together for a fundraiser for the Rocky Mountain Quilt Museum. It's a pine doll cradle, about 18" long. 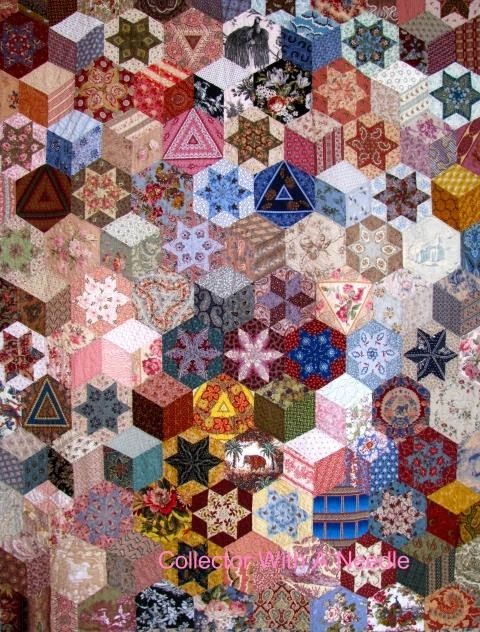 The cradle is filled with bedding and topped off with a little quilt made from vintage quilt blocks. I'm hoping it finds a good home and raises some money for the museum. It's always hard to place a value on something like this. I used red ticking to make the little mattress and a matching pillow. The pine cradle is stained a dark walnut. I used a paste wax to give it a vintage look and feel. It took quite a few coats to get a nice patina. Next, I made some sheets and a pillow case. For the sheets I used a cream cotton broadcloth. The pillow might be a little small in scale, but I think it is still OK.
Next, I put together a little doll quilt made from a pair of vintage quilt blocks. The backing in vintage woven flannel. UPDATE: I decided the little quilt was too small and made a replacement. It was a little larger and filled the cradle better. It is similar vintage fabrics and the same flannel backing. I have a new quilting assistant. 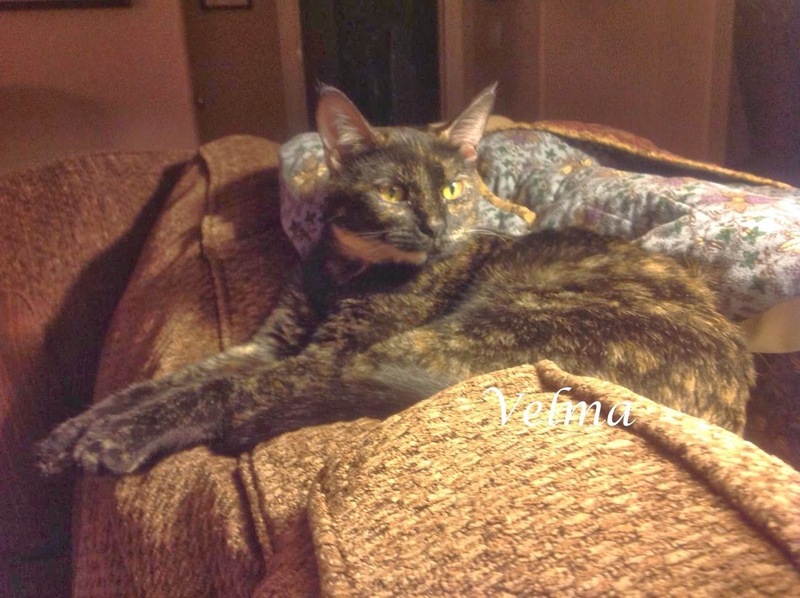 Meet 9 month old Velma. We adopted her from a local shelter. She loves to sit on the quilt frame as I quilt. We were without a pet for a few months. It is a big commitment. A while back I had a little clean out in the sewing room. The kind where I ask myself, "Are you really going to use/finish/keep this?" I put this stack of blocks in our Etsy shop, and hoped for the best. By that I mean, once they sell I no longer have control over what happens to them. Would they be destroyed in some Steam Punk craft? They sold rather quickly. Imagine my delight when I received this photo. The blocks went to the best home EVER. 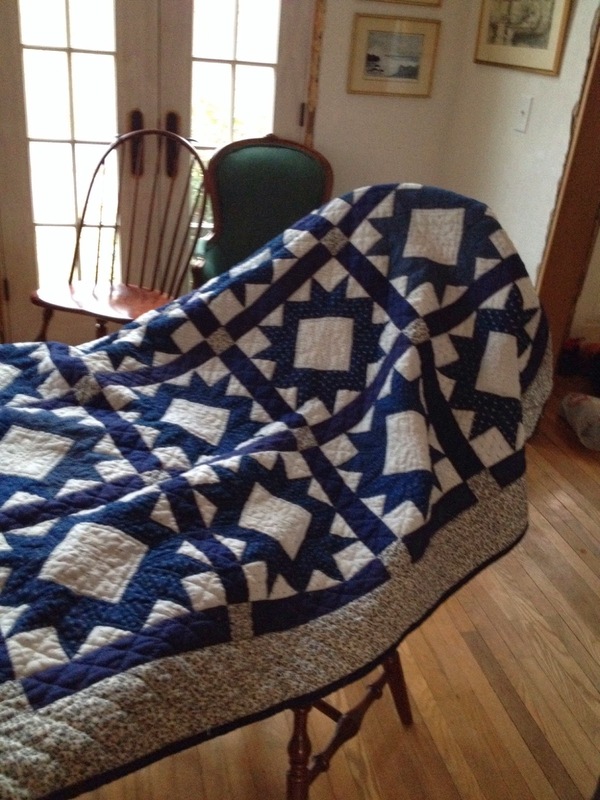 Tracy completed a quilt and took the time to send me pictures. 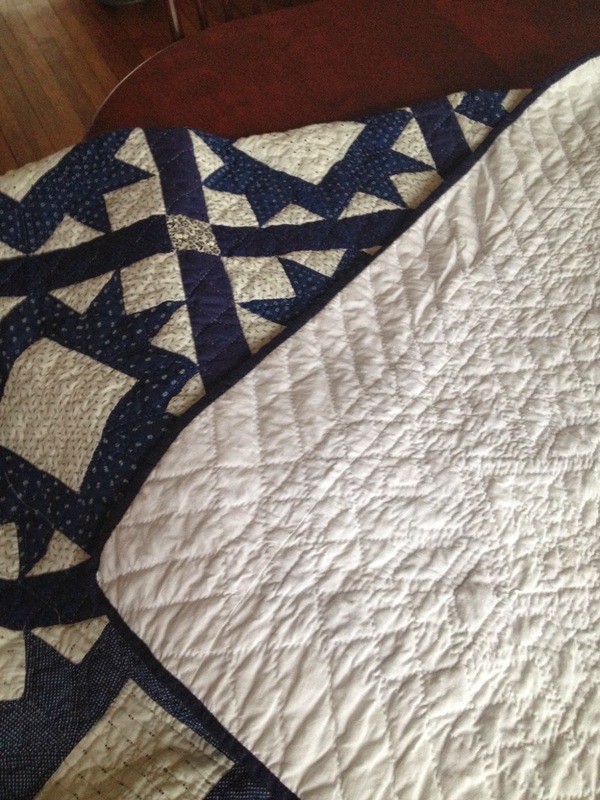 After deciding on the setting and assembling the quilt she spent 6 months hand quilting this beauty. She worked her magic and 'quilted out' those bias edges. Gently 'made' the points work and created a great quilt. How to set 18 blocks? These are the blocks laid out in their new home as plans were taking shape. All kinds of decisions...setting, sashing, borders and backing - oh my! 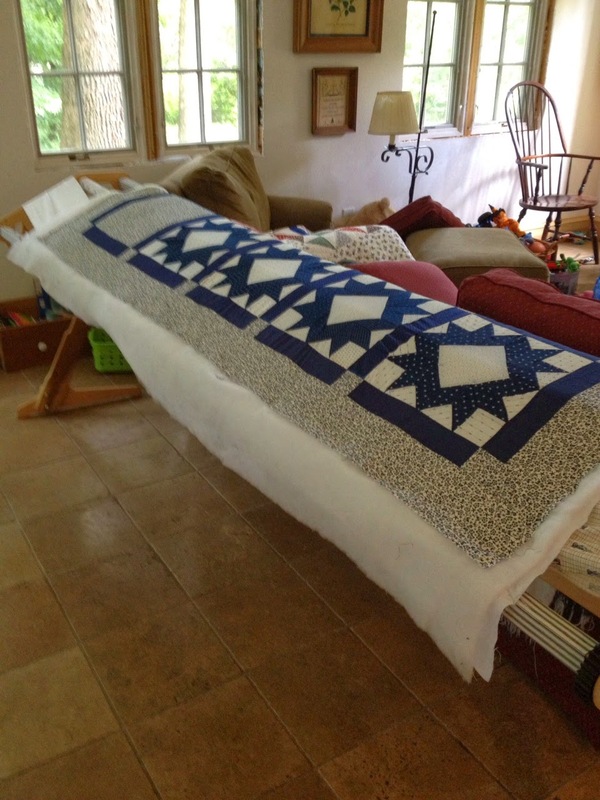 Tracy told me it took several trips to shops to find the right fabrics to finish the quilt. Clearly these blocks found the perfect home. 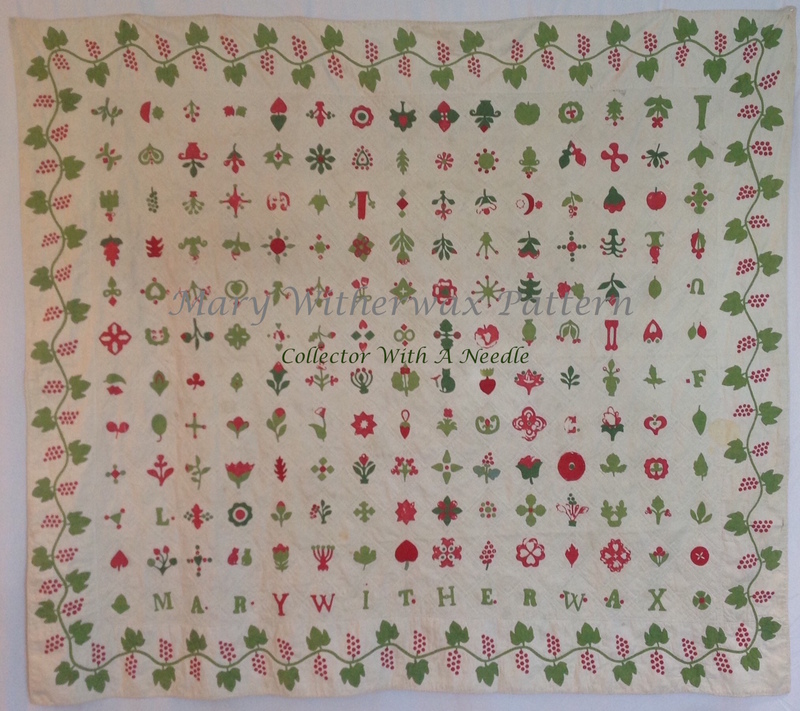 Once assembled, it was time for the quilting. This is the quilt in the frame. Note the setting, and the corner block design solution. Tracy had 18 blocks to work with. She considered a 6 x 3 block on point setting but decided it wouldn't give her the finished size she wanted. 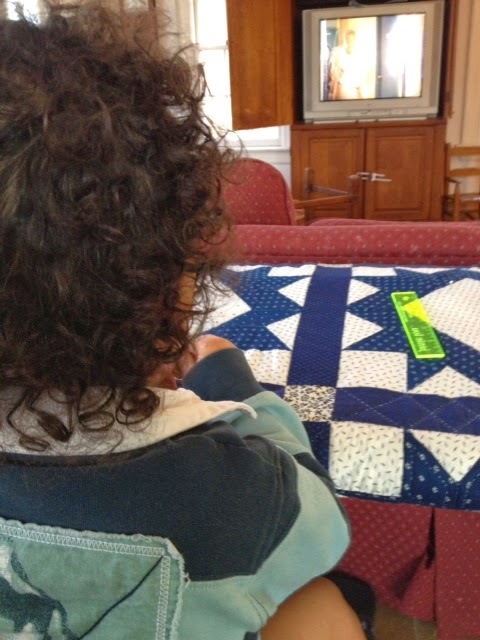 There were decisions on the quilting itself. So many options, maybe an all over pattern? Here's a detailed photo of the hand quilting. 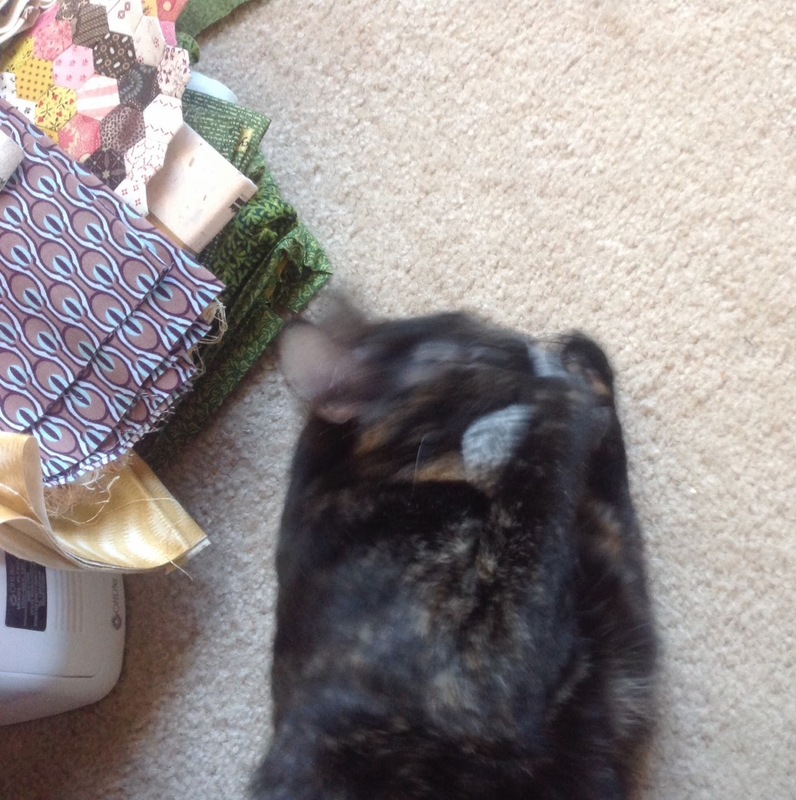 Every quilting project is more fun with help. The frame sits behind the sofa, facing the TV. This is the first quilt Tracy quilted all by herself. 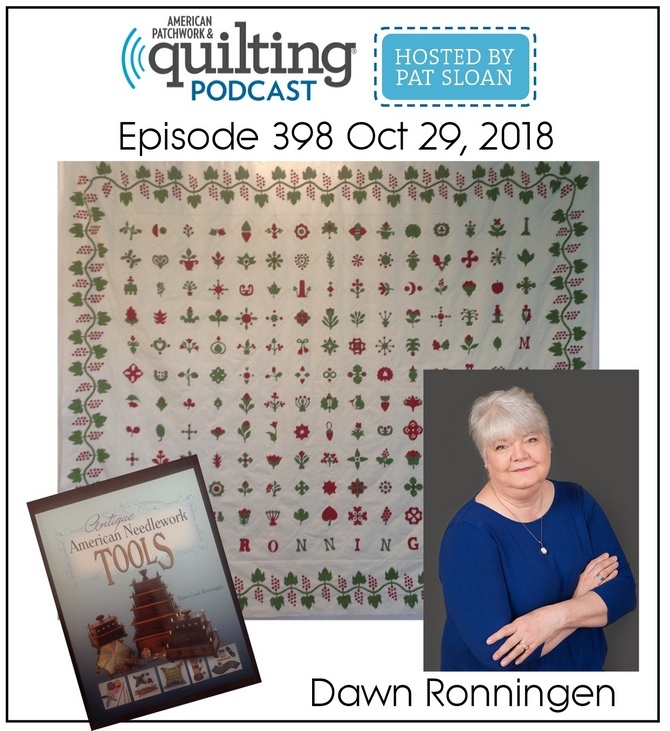 She started quilting years ago with the ladies at her church. This is the back and binding. "I love thinking that someone lovingly and painstakingly made all these blocks, and I understand starting a project, putting it away, and never getting around to finishing. Whoever made these blocks just needed someone else to love them and finish the project." Tracy is not a blogger so please leave her a comment here. I'm sure you are as impressed with her work as I am. Thank you for sharing Tracy!! It is certainly a FINISHED project to be very proud of. 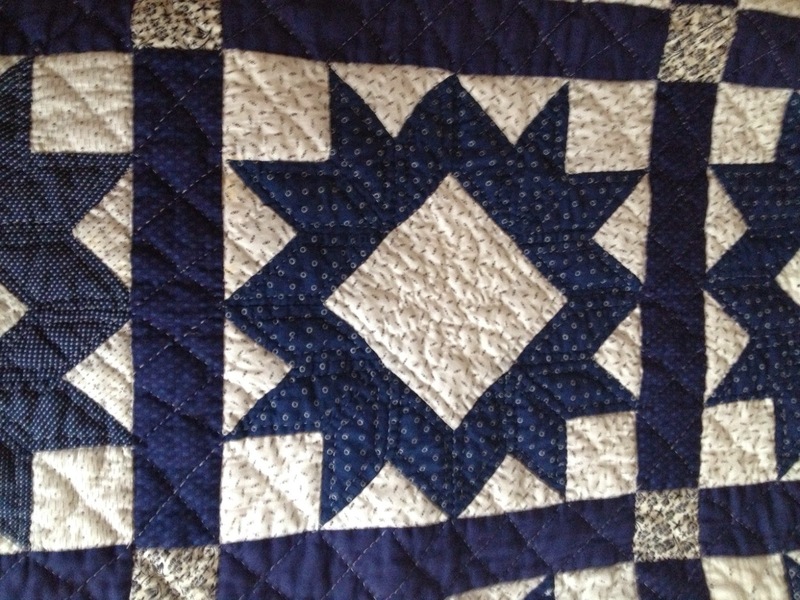 It is rare I want to make a quilt a second time. I hung my Hexy Stars up in the ever changing rotation at the house and I love it all over again. If you've been reading my blog for a while you might remember I posted about it HERE. I finished it many years ago, machine pieced and hand quilted. I think it fits all of the criteria my special person loves about quilts. A variety of fabrics, lots of pieces and colorful. I still have the templates I drafted - it just might be my next project. Here are a few of the fussy cut stars. Stripes are fun to play with. I've added plenty to the stash, so no problem there. 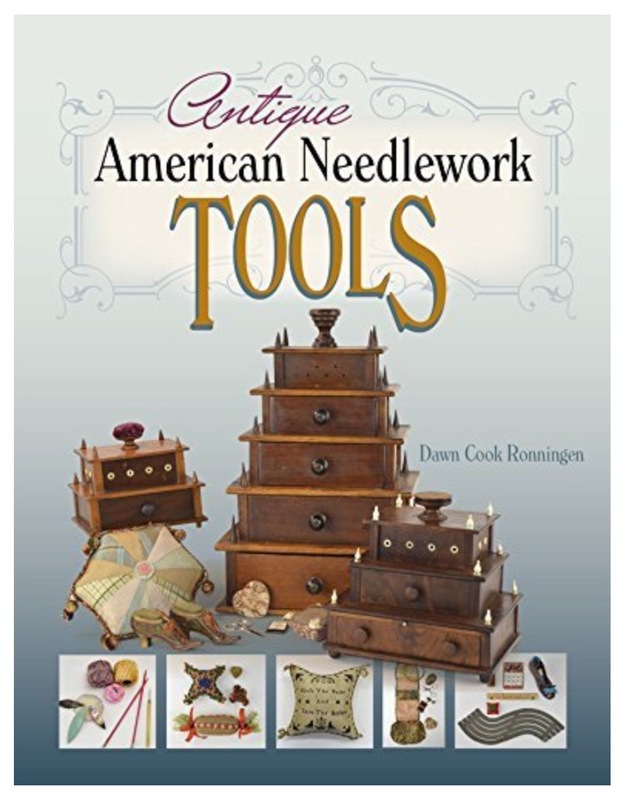 It will be a nice machine piecing project in between all of my hand work projects. Maybe fewer pinks and florals this time. Although, when fussy cut - not all flowers 'read' as floral. Even if the paisleys are not always as symmetrical as one would like - visually, they can still be interesting. I'm not signing up for perfection. I really do love this. I've talked myself into it. No commitment to a completion date. I'll be taking liberties with the fussy cutting again. Using more indigo, stripes and geometric prints, or so I think. The colors and prints will be a welcome variety! Yesterday I was gifted with some fantastic fabrics from a special person - let the cutting begin!! Hope you are up to some fun in your sewing room today.